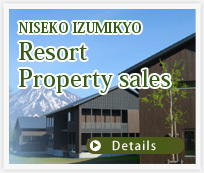 Powder Goya's location not only provides guests with quiet, secluded accommodation, but also amazing Mt Yotei views. The fully equipped cottage makes use of wood throughout making for a warm homely feel. On the ground floor there's a kitchen and lounge, along with a Japanese style unit bath, separate toilet and wash area. The upper floor has a twin bed set up with ample floor room for a third guest to sleep on futon. Located just out of main village, but under 5 minutes walk to free shuttle stops. Laundry facilities in property.